Ashtabhuja Temple is an ancient cave temple dedicated to Goddess Saraswati at Vindhyachal in Mirzapur, Uttar Pradesh. 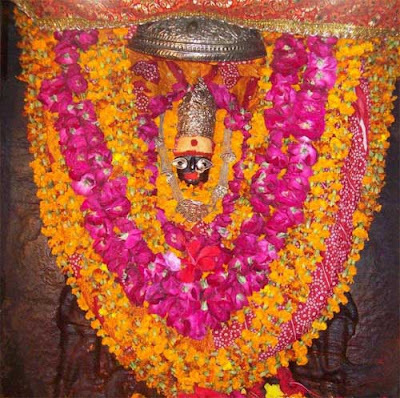 Ashtabhuja Devi Temple is part of the Trikon Parikrama or Yatra of three temples here. The other two are Maa Vindhyavasini Temple and Kali Khoh temple. Trikon Parikrama at Vindhyachal – The temples of the three goddesses forms the three corners of a triangle, and the area encompassed by the triangle is like a yantra. Devotees visit all the three shrines in a day. Ashtabhuja Temple is located on the northernmost part of the Vindhyachal Mountain. Ashtabhuja means one with eight arms. A flight of 222 steps takes one to this cave temple. There is also a motorable road. One can have a panoramic view of Ganga River and the surrounding areas from atop the temple. The main murti of Maa Ashtabhuja is located inside a cave. The entrance to the cave is very low. The murti of Maa Saraswati here is noted for large eyes, which is decorated with a silver ornament. Goddess in the sanctum sanctorum is adorned with North Indian style decorations like gold crown, bangles, necklaces, rings and red color cloth. The murti is always decorated with fresh flowers and garlands. 9-day Navratri is the most important festival here. Both Chaitra Navratri (March – April) and Sharad Navratri (September – October) attracts nearly a million devotees. Saints and pious souls sit in meditation on the Vindhyachal Mountain during the period.